FAA employees in North Carolina shared their support on social media Wednesday. 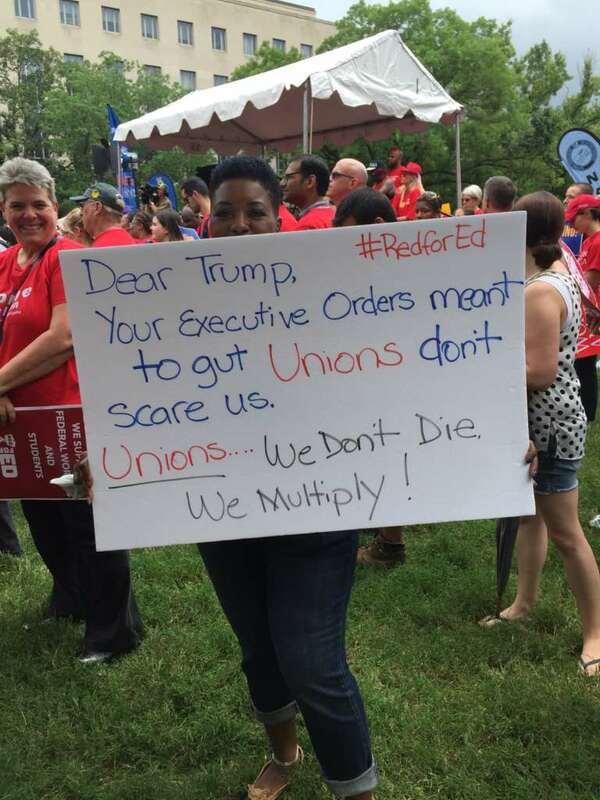 Federal employee unions rallied across the country Wednesday in protest of the president’s three executive orders on employee accountability, collective bargaining and official time. The American Federation of Government Employees have encouraged federal employees to wear #RedForFeds in protest. Nationwide rallies come just a few hours before a federal district judge is set to hear oral arguments in a recent lawsuit against the Trump administration. AFGE and a dozen other federal unions sued the administration over the EOs last month. They argue the orders conflict with the the Federal Service Labor-Management Relations Statute and the Civil Service Reform Act. Agencies with open collective bargaining agreements have slowly been informing union representations of their plans for implementing the president’s orders. Some agencies, such as the Social Security Administration and Housing and Urban Development Department, have given union representatives deadlines for leaving federal property. This story will be updated continuously as the Washington D.C. protest unfolds. Several hundred federal employees, retirees and supporters rallied outside the District Court for the District of Columbia Wednesday afternoon. At its start, #RedForFeds rally was a protest against the president’s recent executive orders but grew into more of a recognition and celebration of organized federal labor. The rally’s organizers encouraged federal employees to put aside their cheers for specific unions and focus on a broader message. Both AFGE and NTEU were well represented on Wednesday, but other organizations — even those not as directly impacted by the president’s recent EOs — stood outside in the drizzling rain to cheer. For Ernestine Ussery, a member with the National Education Association, Wednesday’s protests was one of her first rallies. She said it was important to her to stand up for the rights of the faculty and staff who teach at Defense Department schools, which her organization represents. Some federal retirees also came to show support. Robert Miller traveled from Roanoke, Virginia, to Washington to join his former colleagues at Wednesday’s rally. Jeff Eagan retired from the Energy Department but serves as chief steward for the National Treasury Employees Union Chapter 213. Though the Energy Department’s current collective bargaining agreement has not closed and remains in place after the president issued the recent executive orders, Eagan and NTEU Chapter 213 President Karen Griffin said they’re still concerned. Several members of Congress also came and fired up the crowd.